I spent part of this week looking over comments on the Readers Award ballots EQMM received for the 2015 awards. One reader suggested that we institute an award for artwork—covers, interiors, or both. In general, I think honoring artists is a wonderful idea, although currently the terms of an award would be difficult to craft, since we have been shifting back and forth between photographs and paintings for our covers, and even the paintings we use nowadays (in this era of internet-available stock art) often are not original to our magazine. That said, we greatly value the contributions of our artists and photographers, and I want to devote this post to some reflections about mystery art/illustration. EQMM’s earliest cover artist, and art director, George Salter, was one of his generation’s most distinguished illustrators and book designers. When his own original work wasn’t featured on our covers of the 1940s and ’50s, he brought in other top names in the field, people like Ed Emshwiller, who is probably best known in the world of science fiction, but who also did work for mystery publications. In 1954, Milton Glaser, an artist who would become one of this country’s most famous designers, debuted as a published artist with a cover for EQMM. In celebration of EQMM’s 75th anniversary there will be an exhibit at Columbia University’s Butler Library (mid September through mid November 2016), which will include some of this art. And our September/October 2016 cover will feature entirely new art by Milton Glaser. Given that mystery magazines and books once used many of the same illustrators who worked in the science fiction field, it’s interesting that over time art appears to have become less important in the mystery field while maintaining its status in science fiction. One piece of evidence for the prestige artists enjoy within the science fiction fan community is that the Hugo Awards include not one but two art categories: Best Professional Artist and Best Fan Artist. Science fiction also has the Chesley Awards and the Spectrum Awards (winners of the latter published in a yearly art anthology). Mystery’s Anthony Awards, by contrast, include an art category only intermittently: By my count, just seven times in the history of the awards have Best Cover Art nominations been sought (the last time in 2009). Left Coast Crime, one of the smaller mystery conventions, instituted the Arty, a Best Cover Art award, in 2003, but I have not seen it listed as a category recently. There’s no question, I think, that mystery falls short of science fiction in its acknowledgement of the work of its visual artists. Notice too that those Hugo Awards are given to the artist, rather than for a particular piece of art. I wonder how many mystery fans could even name an artist currently working in our field. Authors may know the names of the artists who worked on their own book covers, but there don’t seem to be many artist names that are generally known in our field anymore—certainly not in the way they were known in EQMM’s early days. It’s good to be reminded that art was once more central to the mystery. A 2003 show at the Brooklyn Museum gathered a number of the few hundred paintings that survive from the pulp cover art of the 1930s, 40s, and 50s—a lot of it in the mystery field. Though most of the artists of that period were paid little for their work, painting over their own canvases once a cover had been shot to save the price of a new canvas, many enjoyed large reputations. Artists like Raphael DeSoto, who did many mystery covers, had their work booked a year or more in advance. EQMM’s George Salter had an international reputation and did book covers for a number of famous authors. I hope there will be another major show of that sort before long, so that a new generation will be made aware of the work of these classic genre artists. For a number of years (roughly from 2003 to 2010) EQMM used reprints of classic pulp and early digest-magazine art for its covers. For a time, readers responded well, and we received an exceptionally large number of letters thanking us for bringing the work back. But in time, we began to get requests for a change, and I had to agree that it was due. In search of a new and distinctive look we transitioned largely to noir-style photographs inset in a solid background with type. And most recently, with the beginning of 2016, we have returned to full-cover art—mostly paintings—with a wider range of subject matter in the images than is typically found in pulp art. It is tempting to think that mystery art reached a peak during those pulp and early digest-magazine years that it hasn’t been able to equal since. My guess is that it’s the themes and subject matter of that period that would come to most people’s minds if they were asked what typifies a mystery illustration. But there are many very talented artists working in the field today, and their work deserves wider recognition. One reason they often get overlooked may be that there isn’t a specific “look” that can be identified with the present day that also proclaims itself to be about mystery—not in the way that a dame in a bar, smoke rising from her cigarette, could do that on a pulp cover, anyway. You don’t even need the props of a gun or knife or poison once that classic scene is set. Cover art by George Salter, 1940s. Cover art by Ed Emshwiller, 1950s. Cover art by Milton Glaser, 1950s. Cover design with photo inset, 2012. Interior art by Allen Davis, December 2015. Interior art by Mark Evan Walker, August 2014. 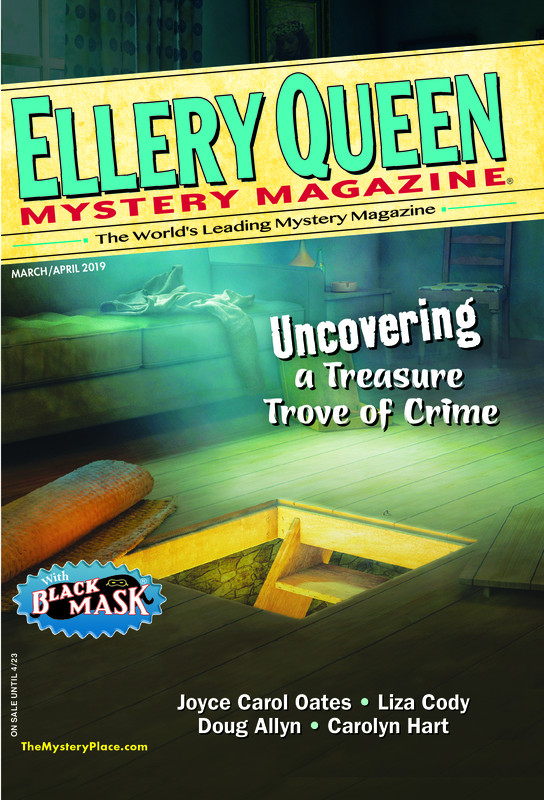 This entry was posted in Awards, Business, Ellery Queen, Genre, History, Illustration, Magazine and tagged art, artist, artists, collection, cover, gallery, illustration, illustrators, noir, pulp, pulp art. Bookmark the permalink. It’s appropriate for this topic to be discussed today because it’s the 90th birthday of one of the most famous cover artists ever, Robert McGinnis. He did covers for many different kinds of paperbacks, but his covers for mystery novels (the Carter Brown covers for Signet and the Mike Shayne covers for Dell come to mind). Most recently his covers have been featured by Hard Case Crime on Max Allan Collins’ Quarry novels. Great post–and thank you for including Glaser’s cover. As soon as you mentioned it I was dying to see it! The Salter covers are the ones that intrigued me enough to buy my first issue of EQMM, so I suppose this explains why they (and the particular typeface used) will always seem to me to be best. Though I have to say that the Glaser covers, which until now I didn’t realize were his, came pretty close. Such a nice post, Janet. I have to admit, I most enjoy those classic ones from the 1950s, especially the Glaser one, as others have commented. I begin subscribing in the 1970s, so those actually feel most familiar to me—nostalgic in a different way. And thanks to Bill for the shout-out to Robert McGinnis, which The Rap Sheet has been celebrating as well. Thanks so much for this feedback, everyone!! And thanks too for letting us know about Robert McGinnis’s birthday. I had no idea.